Excellent quality and easy to assembly the legs to the chaise. 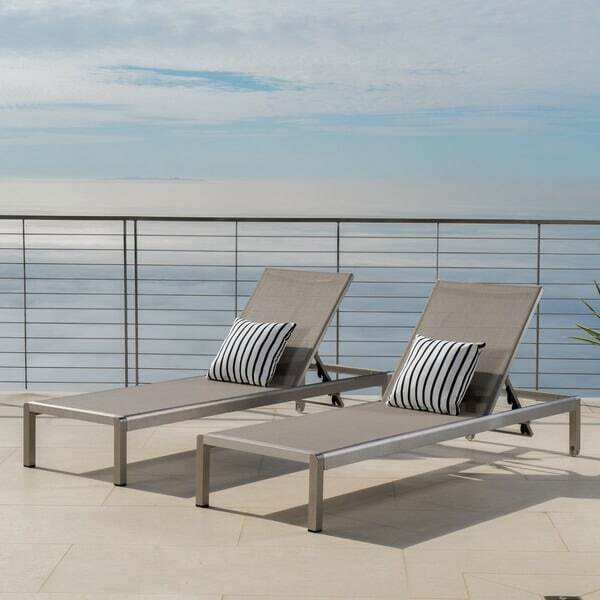 Update your patio and bask in the summer sun with this set of two contemporary-style chaise lounge chairs. Made with synthetic mesh and aluminum, these water-resistant patio chairs are as lasting as they are stylish. The mesh allows water to drain and the chairs to dry quickly. The wheels help to move the chairs easily. They are lightweight and very well made, even according to my very particular husband. This order arrived. It was well packaged. the instructions were clear. However, one of the leg pieces was bent at the instertion site. This did not happen in shipping but the piece that goes into the frame was actually welded on at a wrong angle. I have contacted the company and am waiting for them to send me out a replacement. In the mean time I ordered two more. This came OK and was able to get them together. (51 year old woman) . However I am still waiting on the replacement for the original item. Haven't had a chance to fully break these in yet, but very happy with the quality and appearance so far. The photos are an accurate depiction of the color and quality of the materials. If anything, they are a little nicer than I expected. The back legs of the chair each have polyurethane wheels which look nice and make these chairs easy to move, although they are pretty lightweight to begin with. All parts come in one box and very well packaged. Assembly is extremely straight forward and only takes ~30 minutes from start to finish. The directions advise that you should not tighten everything until you get them where you want them. This is an important step because the legs will shift a bit to ensure the chair is level on the desired surface. I laid down on them to make sure it settled flat. Overall, extremely pleased so far and look forward to breaking these once weather permits. Glad I purchased the lounge chairs to complete our patio set, we really love the entire set of the cape coral collection. These lounges did not disappoint! Very easy to assemble (8 screws into each lounge, and the allen wrench was included). The frames have a nice, clean line, are sturdy while still being light weight and the mesh material is close-knit and strong. I ordered the dark grey color and was very happy to see that they looked exactly like the pictures. Would definitely recommend if you are looking for a new addition to your patio furniture. Beautiful, contemporary, quality! We really like the Cape Coral chaise lounges by Christopher Knight Home. They were easy to assemble once the brain processed the instructions. We received them in a very timely fashion. 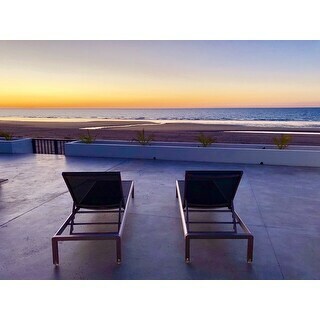 We purchased these lounges for our Sandy Toes Florida beach house in Alligator Point. For the price, these chaise chairs are great! love the sleek design, aluminum frame, easy care. Arrived is perfect condition. Easy to assemble. Would highly recommend. modern and sleek lounge chairs. These chairs are great for almost any outdoor space. Very beautiful. Bought the Cape Coral C-table to go with it. Both aluminum and won't rust. Very happy with my purchase. These are nice, but the metal has major discoloration. The wheels work great and they are lightweight. They are a bit darker than they looked, but just as good. PRO:Very attractive CON: 4 out of the 16 screws could not be tightened because the hole was tapped incorrectly. Also one of the lounges was badly scratched. I would like to buy another set but I think I will pass. Really like these, however getting the legs into the frame during installation was a bit challenging. They didn't exactly line up and I ended up bending one of the front panels trying to hammer it in. But overall really nice pieces. It’s beautiful in theory. However, it’s badly designed garbage. Parts were badly fabricated so that furniture couldn’t be assembled. Replacement parts have same design flaw. It’s complete crap. Too big to send back without a huge hassle. Overstock keeps saying they are surprised because of the vendor. Run from this stuff. It’s not worth your money or your time. Very nice and priced right. There are so many of these to choose from but I have already found you the best ones for the best price. Sturdy, attractive and a cinch to put together. These lounge chairs arrived very well packaged and they were nearly assembled, just needing a few screws to attach the legs. They work and look great, just as pictured. The wheels are an added plus making them easy to move without scratching against the patio. I like that the chairs lay down flat. Cool to touch. Yes I would recommend them to anyone. Very nice lounge chair for a reasonable price. the frame is made out of brushed aluminum, doesn't get hot in the sun. however the mesh material looks great but you can already see it wearing out after a couple of days. (visible "dents" from lying on the lounge chair) - customer service from overstock helped us very fast with our issue. besides this, i recommend wearing gloves we attaching the legs, as the cut corners are very sharp. This lounge set is a great value. The aluminum construction is solid but still very light and portable. The low profile allows it to not get blow around even in a large storm. The actual plastic surface is comfortable, waterproof, and easy to maintain. The lounges March my patio furniture They look fantastic. Love them no issues, easy set up and very slick lines. "What is the material? Is it like the screen stuff? " "What are the chaise wheels made out of? Plastic? Rubber? " The wheels are made of rubber. "What is the weight limit of the chaise?" "Are they comfortable for sitting and reading? Current furniture gives us a stiff back in 15 minutes." Unfortunately, we cannot confirm comfort level as that is subjective from individual to individual. "Are these UV resistant? Be left outside year round?" This is not UV resistant. They are weather resistant, however, we recommend the items be stored or covered during extreme weather conditions to prolong the life. You will need to attach the legs. "Do the slings stain easily?"